Great - thanks. Last question... Do you think this was the 311th convertible made in 1956? Hi John - I was able to find my glasses and had another look and you are correct - the plate actually reads: BY76B 25-630-B23-311. Based on your earlier note - I am guessing that the car was made on February 23rd and must have been the 311th on the line that day. Please let me know if you think that is correct. Thanks. Thanks john - I'll have another closer look but I am 90% sure I read it correctly - I'll confirm. In the meantime, based on your research, perhaps the "823" might mean August 23rd and the "311" is the rotation number that you mentioned. Either way I appreciate your time to look that up for me. I will look for those two books that you mentioned as well - Thanks. I bought this 1956 Premiere at auction, sight unseen. I thought I was buying a sedan with the roof cut off but it turns out to be a real convertible that just received a new paint job, engine re-build and paint and new interior. The roof hardware was in the trunk but is missing the roof fabric and some of the trim. Also missing is the exhaust that was not put back on when the engine was re-installed. Overall a really great find. 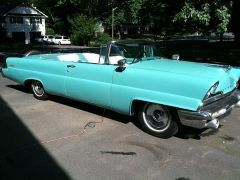 Hello - I just purchased sign unseen a 1956 Lincoln Premier with about 35K miles on it. I thought I was buying a sedan with the roof cut off... but in the trunk was all the hardware for the convertible top. New paint, new interior, rebuilt and detailed engine bay - a lot better than I was expecting. I have the data plate information and was wondering if anyone out there can help decode it for me? The Data Code is BY76B 25-630-823-311. Any help would be greatly appreciated. Thanks. Hello - I am the new owner of a 1956 Premier - Vin #56WA27337L. The vehicle I bought has been refurbished and looks brilliant - delivery is set for next week to me. I have searched the web for a VIN Decoder for this vehicle and am able to find general information but nothing specific. The car I have bought is a convertible and I would like to know if it was born that way or if it has been modified to become a convertible. I am also interested in knowing what the original color was and so forth. If anyone can help me in my detective work - I would greatly appreciate it. Thanks.